With autumn here, I’ve got butternut squash on the brain. This sweet squash is really healthy and versatile. It’s loaded with vitamins A and C, making it a more nutritious alternative to starch-heavy potatoes. Last week, I started wondering how butternut squash would taste as a gratin, so I experimented and tested a few ideas. This recipe is what I came up with. 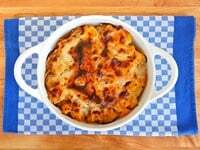 It’s a unique twist on a classic gratin, and it would make a fun (and tasty) addition to the Sukkot or Thanksgiving table. For those of you who’ve never tried Gruyère cheese, you are in for a treat. It’s a semi-hard yellow cheese with a slightly sweet, slightly salty, nutty flavor. The cheese originated in Switzerland near the French border. After the fall of the Roman Empire, a group of Germanic immigrants settled among Romanized Celtic inhabitants of the Swiss highlands. This group of new settlers led to an increase in alpine cheese making in the ninth century. In the eleventh century, the counts of Gruyère were given feudal authority over the highlands of the region, including the western alpine cheese making region. The counts capitalized on the growing cheese trade by taking control of the highland grazing areas and summer migration routes. Gruyère gained a reputation for producing outstanding cheeses. By the Middle Ages, an entire family of alpine cheeses were being made throughout the Alps, including the cheese we know today as Gruyère. I love this gratin. The natural sweetness of the butternut squash is accentuated by a roast in the oven with garlic prior to assembling the gratin. The cheese sauce is a variation on my Roasted Cauliflower Gratin sauce. Here, I’ve used Gruyère cheese and a touch of nutmeg, which is the perfect accent to the sweet squash. After testing the recipe a couple of times I felt it needed more texture, so I toasted some chopped walnuts and sprinkled them over the squash before baking. After a brief browning beneath the broiler, a beautiful gratin is the result. It’s sweet, salty, nutty, and so unique… the perfect side dish for autumn. New to butternut squash? Check out my post All About Butternut Squash for everything you need to know about peeling, seeding, and prepping this hard-skinned winter squash. If you’re gluten free, I’ve provided a simple GF modification below. Those who have nut allergies can feel free to omit the walnuts, the dish will still be very tasty without them. 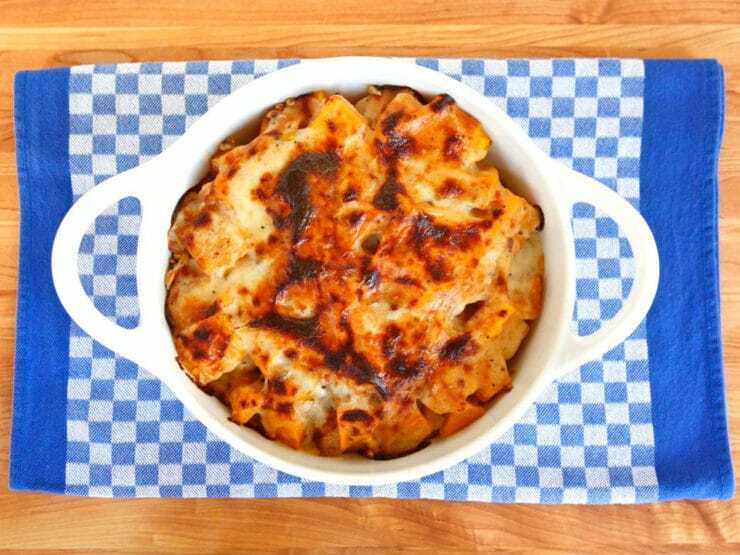 If you need a gratin dish, try this one! It’s the dish I use in my own home, I recommend it highly. Enjoy! Recipe for sweet roasted butternut squash in gruyere cheese sauce with crunchy toasted walnuts, baked and broiled into a gratin. Kosher, Dairy. Gluten Free Modification: Substitute 1 tbsp potato starch for flour. 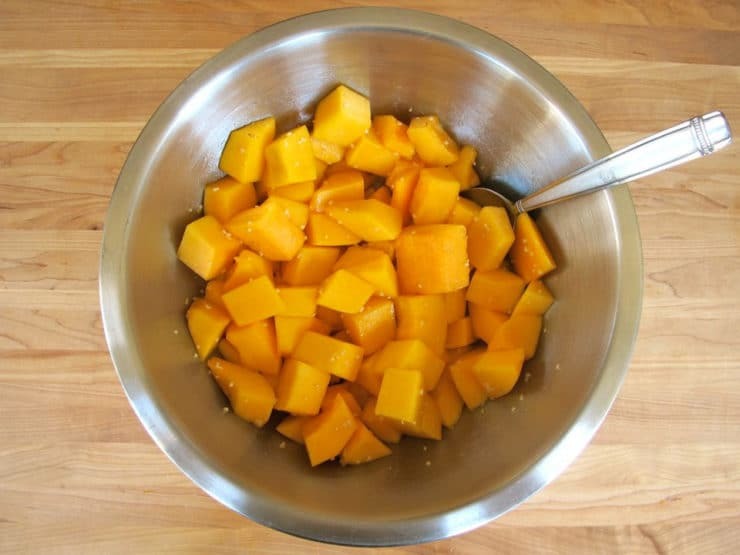 Preheat oven to 400 degrees F. In a large mixing bowl, toss the butternut squash cubes with the olive oil and garlic till the squash is evenly coated with the oil. 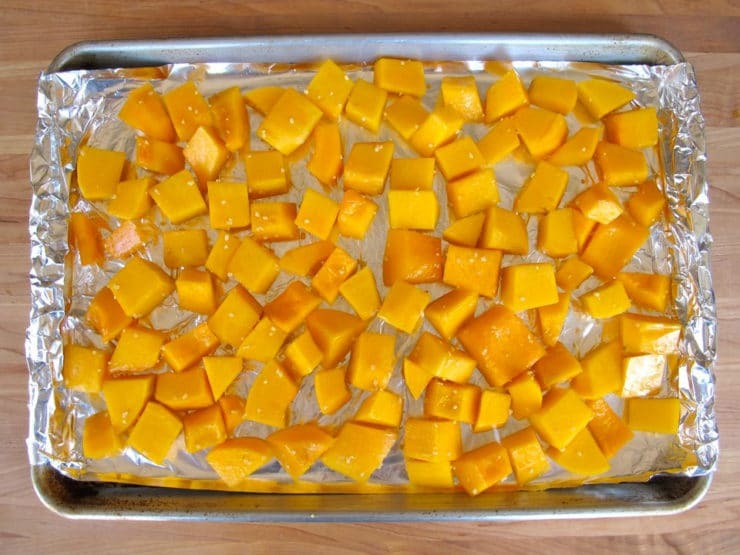 Spread the squash out on a baking sheet in an even layer. You can line the sheet with aluminum for easier cleanup, if you wish. Sprinkle the squash lightly with salt. Place squash in the oven and let it roast for about 35 minutes, turning once during cooking, till squash is tender but not overly soft. 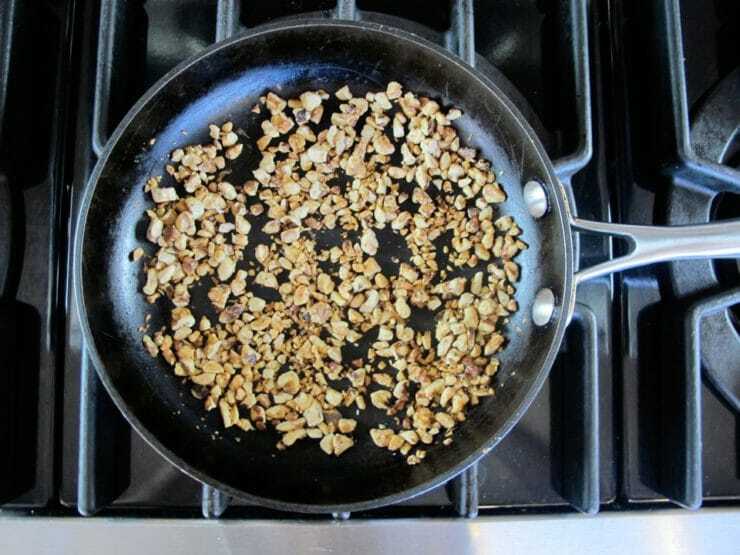 Meanwhile, spread the chopped walnuts in an even layer in a small skillet. Toast the walnuts over medium heat, stirring frequently, till they're toasted and fragrant. Be careful not to let the walnuts burn-- as soon as they're toasted, pour them out of the skillet to keep them from browning further. 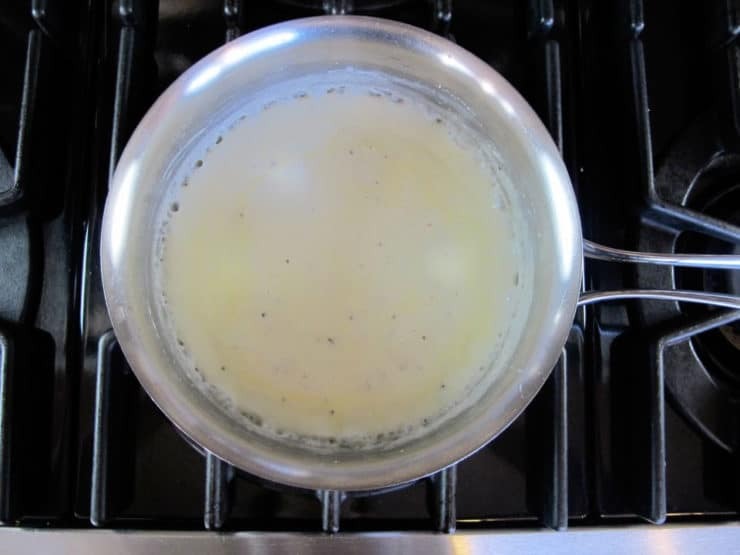 In a medium saucepan, melt butter over medium heat. Whisk in the flour, salt, and pepper. Stir to form a thick paste. Slowly whisk in the milk, ¼ cup at a time. 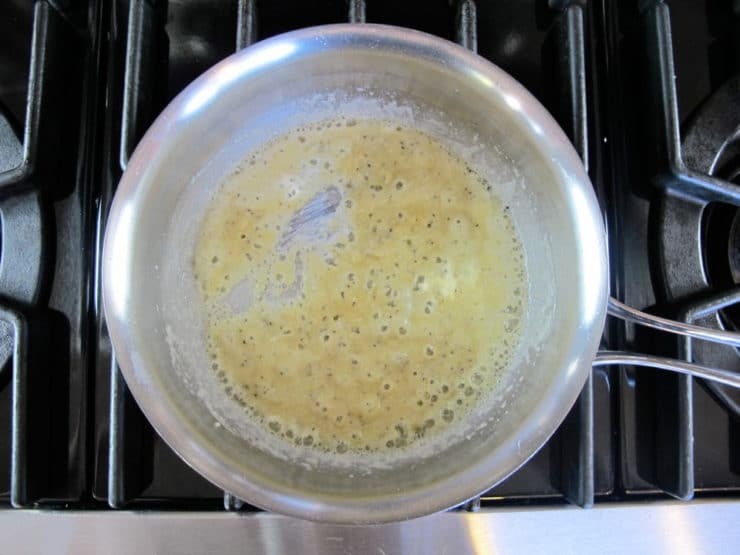 Heat the milk mixture over medium heat for a few minutes, whisking frequently, till it thickens and begins to bubble around the edges. Do not let the sauce boil. Whisk in the grated Gruyère cheese and stir till melted. Whisk in a pinch of nutmeg and more salt to taste, if desired. Reduce heat to lowest setting, stirring frequently, until ready to assemble the gratin. 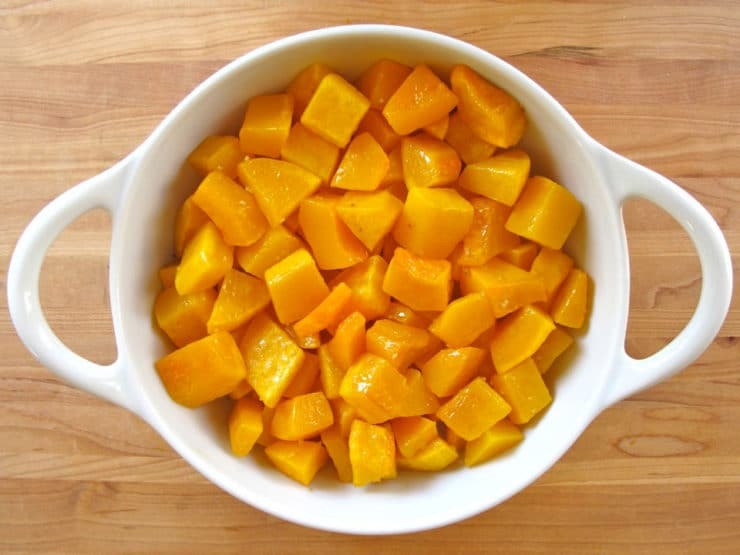 When the squash is done roasting, remove it from the oven and turn the temperature down to 375 degrees F. Place the squash into a gratin dish or 8x8 inch squash baking dish in an even layer. 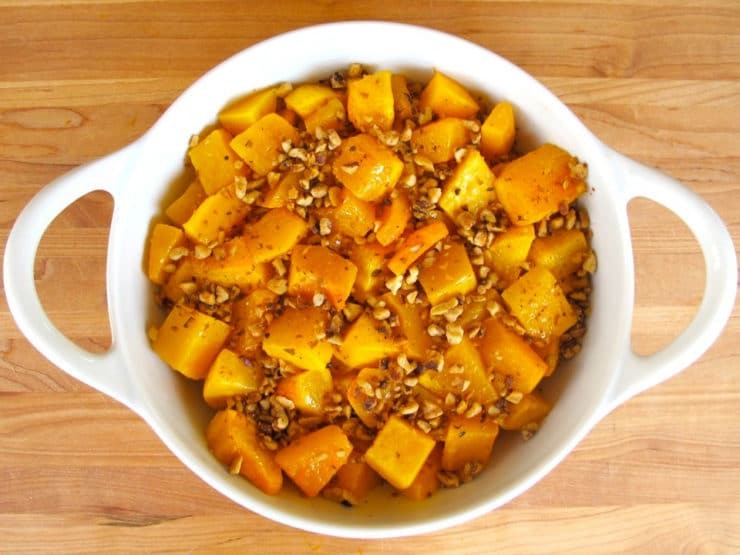 Sprinkle the toasted walnuts evenly across the top of the squash. 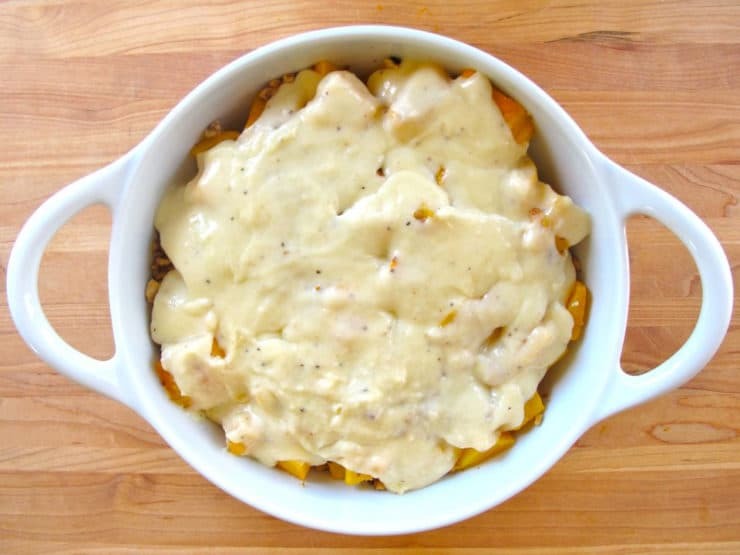 Pour the gruyere cheese sauce evenly across the top of the butternut squash. Place the assembled gratin into the oven and bake for 20-25 minutes till edges begin to brown and the cheese sauce is bubbly. 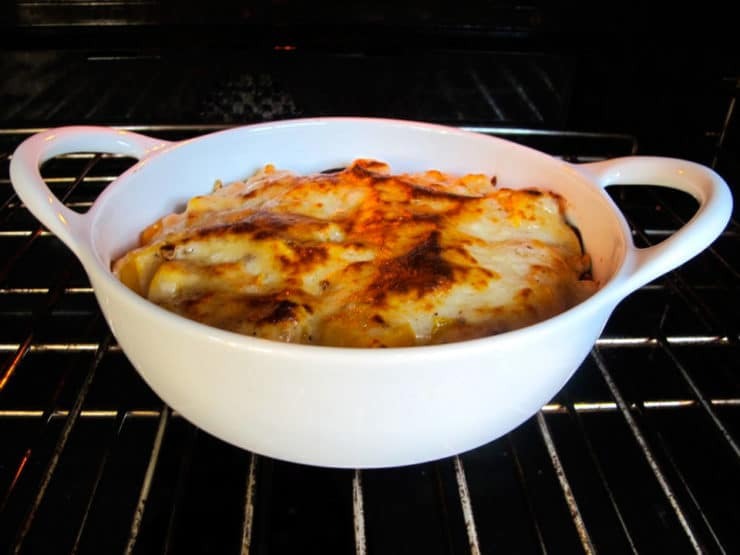 Remove the gratin from the oven and turn on your broiler. When broiler is hot, place the gratin back in the oven and let it brown under the broiler for 1-2 minutes, watching it carefully, till the top is browned to your liking. Vegetarian note: If you are strictly vegetarian (no cheese with rennet), make sure you find a cheese with a microbial rennet. Kindstedt, Paul S. (2012). Cheese and Culture, A History of Cheese and Its Place in Western Civilization. Chelsea Green Publishing, White River Junction, VT.
Could I make this up with the sauce and leave it while the next day to cook it? Hi John, Tori’s assistant Ashley here. I would recommend waiting to pour the sauce over the top until you are ready to bake. For those who are dairy intolerant try using Daiya cheese and almond milk. I haven’t tried it in this recipe, but I have in others and it works. Highly recommend this recipe! I had sweet potatoes on hand, so I substituted them for the squash. I baked them for 25 min. at 325. 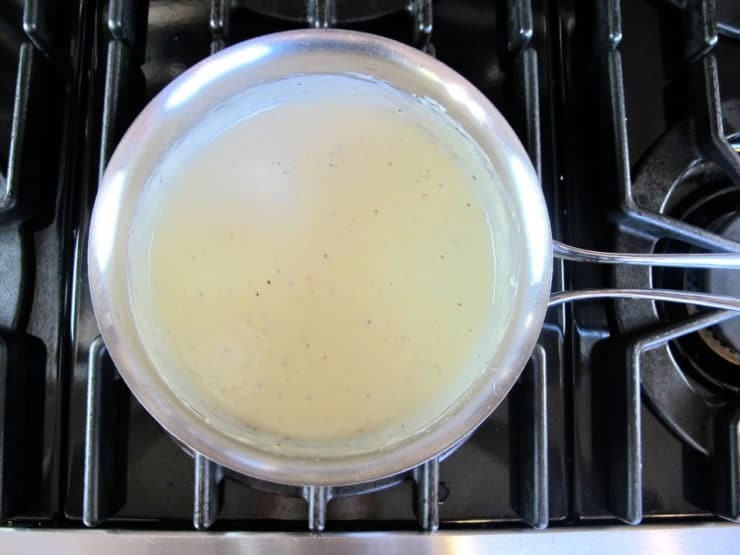 The end result was incredible — best cheese sauce I’ve ever made! This is a delicious meal! Thanks for the step by step instructions! Making it tonight, on our first rainy SoCal day. Thanks so much for the how-to prep for roasting. Much better than paying premium for frozen. Our family loves experiments, especially comfort food trials. 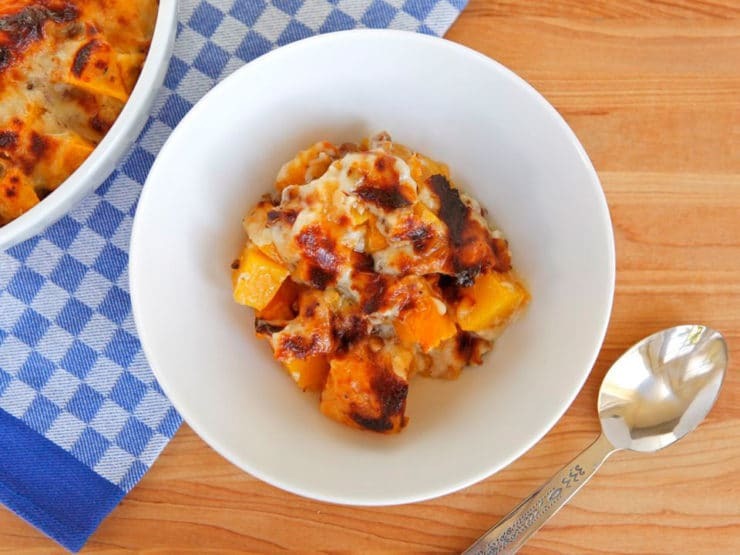 I really like the sound of using squash in a gratin! I know it is good in lasagna and mac n cheese so I should be a hit in a gratin! Sounds delicious! Thank you for giving a gluten free substitution! For those who are not in favor of Walnuts, you can substitute sunflower seeds. It has the same woodsey taste. I really love your stories on every recipe! Even if only one eats turkey, they feel turkey is tradition on Thanksgiving. If I get the guts, I will make the soufle and have a chocolate turkey on the table. Butternut squash and Gruyere cheese are two of my faves (okay really almost any cheese is my fave), together in one dish. My goodness.